Sugar Creek Alzheimer's Special Care Center in Normal, IL, provides both Alzheimer's care and respite services to residents in our beautiful community just one mile from Advocate Bromenn Medical Center and near St Joseph's Medical Center. Our Nursing Director is on-site and meets regularly with residents family members and physicians and specialists in order to create and follow an individualized plan for each community member. 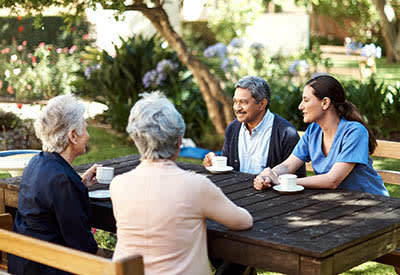 Memory Care: Residents of Sugar Creek Alzheimer's Special Care Center receive the care of specially trained staff and nursing members in our Meaningful Moments® program. Through this program, our care team learns the individual life stories of all of our Alzheimer's residents and uses it to bring deeper meaning to their days. Respite Care: Our nursing staff is here and ready to assist with any extra help needed after a hospital stay and while recovering from an injury. Dressing, bathing and pain and medication management are all provided to our respite residents. Both our dementia and respite care residents have a choice between a private room or semi-private suite for a more affordable and social experience. All rooms come fully furnished with large windows and views of our courtyard or front walkways.